With the progress in the digital world there are more and more e-tools available for research and teaching. What are smart ways to make use of new techniques in teaching? 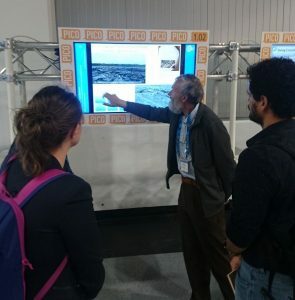 For inspiration and learning, Hans de Bresser, Janos Urai and Neil Mancktelow convened a PICO session at the EGU 2017 General Assembly to showcase present-day e-learning opportunities to improve the efficiency and quality of teaching structural geology and tectonics. 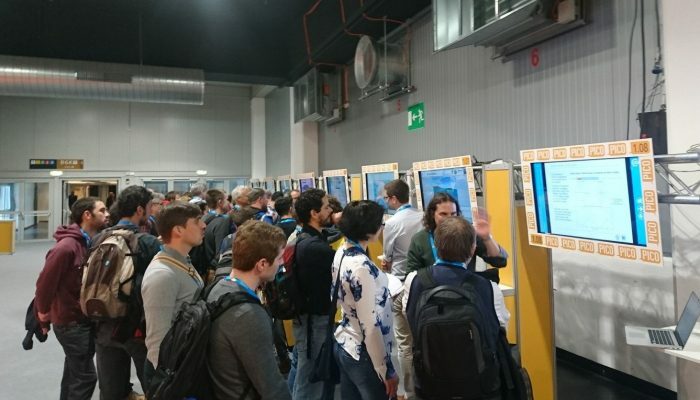 Despite an 8h30 morning slot and a limited number of abstracts, all spots during the 2 min madness were taken and all authors were talking the full 90 minutes – and some even well into the coffee break – about what they are using and how. Inspirational and fun! Hans, you’re somewhat of an expert on teaching in Utrecht as former head of teaching in geosciences, how would you say that teaching has changed from back when you were a student? ”In my time as a student, I spent hours learning to identify rocks and recognizing minerals in thin sections, browsing back and forward in text books packed with determination tables and graphs of which more than half was not relevant for me. I also invested a lot of time in making maps in the field, carefully adding measurements and colors, hoping that I did it right the first time (never) and that I wouldn’t spill coffee over my precious products (it happened). And I sat in classes in which professors talked for hours, repeating the content of books that I had in front of me, while my level of activity in class was so low that preventing to fall asleep was a serious challenge. I really learned a lot, definitely had a lot of fun, but looking back I feel it could have been done more efficiently. New styles of teaching, such as blended learning and flipping the class room, and state-of-the-art e-tools for data collection, modelling and visualization now help us to be very efficient and improve the quality of teaching. And it can be fun”. Broadly speaking the presented aids can be divided in the following 3 categories, for each category we give examples below. 1. How to bring the real and experimental world into the classroom? 2. How to make life easier for a teacher? 3. Can we add extra information using the virtual world? Category 1: How to bring the real and experimental world into the classroom? Virtual landscape, presented by Benjamin Craven: a 3D model of a field area, to bring the real world in the classroom, and increasing the efficiency of real world field teaching. Different packages of open source software make it easy to design your own landscapes, though you can also make use of the already made world. One could also teach students photogrammetry, to enable them to make their own 3D models using photos made with a smart phone, of rocks or other items in the classroom. One idea is to ask students to create a geological map in the virtual “field”, but then to give each student only a limited amount of time to do so. This allows them to learn how to plan their time in mapping projects. Drones and 3D models , presented by Thomas Blenkinsop. Using drones one can make 3D surface models, which can be combined with cross sections to create a 3D MOVE (TM Midland Valley) project. It starts with the regular manual work, but adding the digital models improves 3D thinking as well as it allows students to check their own cross sections. Deforming ice with students, presented by Dave Prior. A low-cost ice deformation rig, designed to be used by student teams. It brings Dave’s own research into the class room. Through a questionnaire teams were designated by Dave to get the right mix of skills to eventually present a poster. Some results are of high enough quality to publish. Thomans Blenkinsop explaning about using drones, Lidar measurements and 3D models for undergraduate teaching. Credit: Anne Pluymakers. Category 2: How to make life easier for a teacher? Jupyter notebooks, presented by Florian Wellmann: software for those who can’t program. It makes it easier to create exercises, and to allow students to play around with parameters. Automatic and manual exercise grading are both easy. STEREOVIDEO, presented by Jose A. Alvarez-Gomez. This is a (currently Spanish only) channel with various Youtube video instructions on how to use stereonets. The channel will bring more subjects later. It is very popular in Latin America. Category 3: Can we add extra information using the virtual world? John G. Ramsay1 wrote his seminal textbook on the folding and fracturing of rocks in 1957, almost 20 years before I was born (and I don’t count myself as young!). 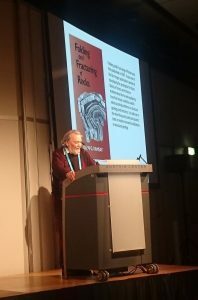 So why did I co-convene a session at EGU in 2017 to celebrate the book? Because the book, in many ways, expresses the legacy that John has given to structural geology. He followed it with a series of books of the same ilk – Ramsay and Huber ‘The Techniques of Modern Structural Geology’, published in two volumes (1984 and 1987), was a main stay for me as an undergraduate and postgraduate and well actually now; although, it is often not to be found on my bookshelf, but on the desk of one of my graduate students. The Techniques of Modern Structural Geology, like the Folding and Fracturing of Rocks, is beautifully illustrated and describes geometrically and mathematically many of the now commonly used techniques in structural geology. So to me Ramsay, although I did not know him personally, was the name behind this interesting subject structural geology. It was as a postgraduate student that I met John at a Tectonic Studies Group (TSG) meeting and had the pleasure of dancing with him after the conference dinner! Many years on I am now the Chair of TSG, one of several specialist groups affiliated to the Geological Society of London. John was instrumental in founding TSG in 1970 @TSG_since1970 , when he was working at Imperial College London. As the Chair of TSG I was approached by several people enquiring about plans to celebrate 50 years since the publication of the Folding and Fracturing of Rocks. 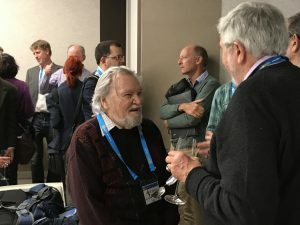 Given John’s European career and global impact EGU seemed the place to celebrate and I contacted some of John’s PhD students and collaborators to join me in convening a session to celebrate the book, John and structural geology. Early on the morning of April 25th John gave the opening paper for the session to a large audience. He spoke not to a series of power point slides but to the audience about the book, his interests and his life as a structural geologist. I think one of the key messages for me is the one that he ended his paper with; that fieldwork is fundamental to structural geology and models need to be derived from and tested against field observations. 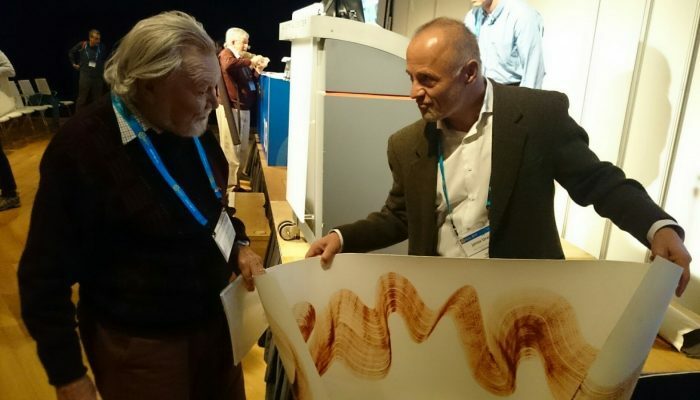 John was followed by a series of speakers from Rod Graham, of Ramsay and Graham (1970)2 on shear zones from the field to seismic interpretation, to Richard Lisle (co-author with John on the third volume in the Techniques of Modern Structural Geology series)3. Richard gave an overview of the citations for the Folding and Fracturing of Rocks; it is the most cited structural geology textbook. Further papers were given in the afternoon poster session, celebrating and giving modern, and old, twists on aspects of the book. John joined many well-wishers at a reception and dinner after the session. John has given a legacy to structural geology, through his focus on the geometry and mathematics of structures backed up with detailed field observations, work that very much forms part of modern structural geology today. The Folding and Fracturing of Rocks is currently published by Blackburn press. Click here to go to the webpage of EGU Session TS1.3. 1.John was born in 1931 in London, he was educated at Imperial College, London gaining a first class degree in 1952 and a PhD, working on superposed folds at Loch Monar Scotland. After military service he returned to the staff at Imperial, before taking up Professorial positions at the University of Leeds and the ETH in Zurich. He has been recognized for his work in advancing structural geology with many awards: Bigsby (1973) and Wollaston (1986) medals of the Geological Society of London, the Société Géologique de France Prestwich Medal in 1989, Sir Arthur Holmes Medal of the European Union of Geosciences (EGU) in 1984, C. T. Clough medal (1962) of the Geological Society of Scotland, the University of Liège medal in 1988. In 1992 he was named a Commander of the Most Excellent Order of the British Empire in the Queen’s Honours list. He is a Fellow of the Royal Society(elected 1973), and holds Honorary Fellowships of the Geological Society of America, the Société Géologique de France, the Indian National Science Academy, the American Geophysical Union, the US National Academy of Sciences and the Geological Society of London. 2.Ramsay, J.G. and Graham, R.H., 1970. Strain variation in shear belts. Canadian Journal of Earth Sciences, 7(3), pp.786-813. 3.Ramsay, J.G. and Lisle, R.J., 2000. The techniques of modern structural geology. Volume 3: Applications of continuum mechanics in structural geology. Academic, San Diego, Calif.
You’re an early career scientist and you want to go somewhere… but where? 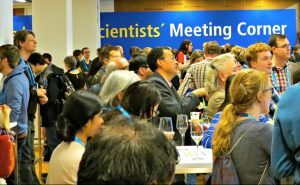 Only a few more days and the General Assembly of the EGU 2017 will start! Five exciting days with science and the opportunity to meet your colleagues and collaborators, both the old and the new. 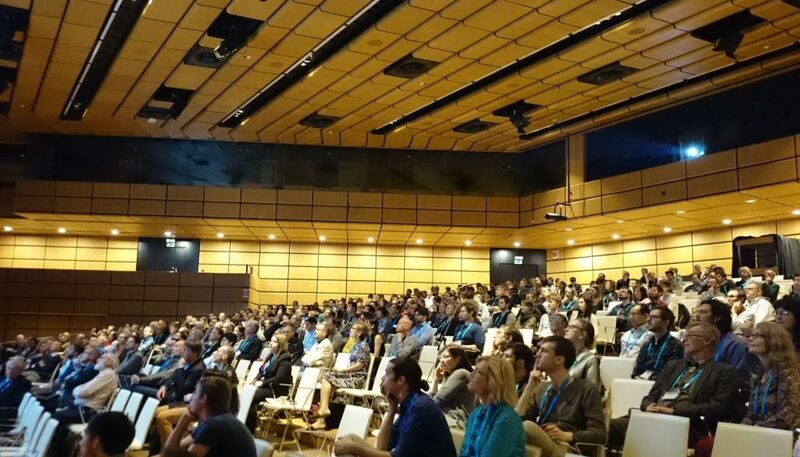 Earlier this week the outgoing TS President Susanne Buiter and the incoming TS President Claudio Rosenberg posted a blog with TS highlights, but what are the must-see for the Early Career Scientists? This is where we, outgoing TS ECS reps, come in! So we provide here tips for the hottest TS ECS events the coming week. Don’t forget to come for dinner with the other TS ECS at Brandauers Bierbogen (Heiligenstädter Str. 31) on Monday, at 20h. We welcome everyone to the ECS corner at the icebreaker on Sunday. Pick up your badge, meet old and new friends at Foyer E, from 18h30 to 21h. The TS Division Meeting is on Wednesday, 12h15-13h15. Lunch will be provided. What happened within the TS Division last year? What are the plans for next year? Come give feedback! Your new TS ECS representative Anouk Beniest organizes an informal get-together over lunch on Thursday. 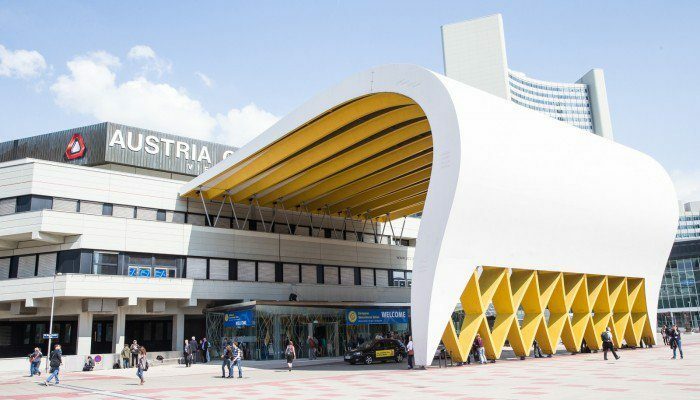 We meet at 12h15 at the EGU flags just outside the building, we’ll get a sandwich and find a nice spot to sit and chat on how to improve things for TS ECS. All are welcome! 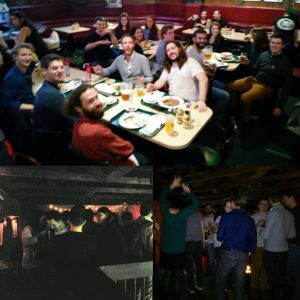 Meet your reps! The EGU Division President Claudio Rosenberg and the outgoing ECS Representatives Anne Pluymakers and João Duarte plus the incoming ECS Representative Anouk Beniest! They will all be at the EGU booth on Thursday from 14h15 to 15h. If you like fully open access and transparent publishing, you should consider the course on how to publish in EGU journals: Solid Earth and Earth Surface Dynamics. Meet the Editors on Monday, 13h30 – 15h in room -2.91. Of course we would love to see more TS-related research, also by the youngsters! So come to ‘How to write a successful ERC Grant proposal’ on Tuesday, 13h30 – 15h, in room -2.91. After open access publishing, we seem to transition now towards open science: all data available for everyone. Is this really the way to go? Come to the panel debate on Thursday, 15h30-17h in Room E1. With the decreased amounts of funding and less and less permanent jobs the pressure of ‘publish or perish’ is mounting. What is the best way of judging early career scientists? Come to the group debates on Wednesday 19h-20h30 in room G1. Every TS session is an ECS session! So browse the program, and look for something that captures your interest, either directly inside your field or just outside. Due to its size EGU is the perfect conference to look across the boundary into other fields. Create your program online and download it into the EGU2017 app for Apple and Android. If you have no other plans, come to the Arne Richter Award lecture by outgoing ECS rep João Duarte “The Future of Earth’s Oceans: consequences of subduction invasion in the Atlantic” on Wednesday 9h30–10h in Room D3. Equal opportunities for all! On Friday there are talks from women in geosciences from 10h30 to 12h15 in Room L4/5 and on equal opportunities in general from 13h30–17h in Room L4/5. 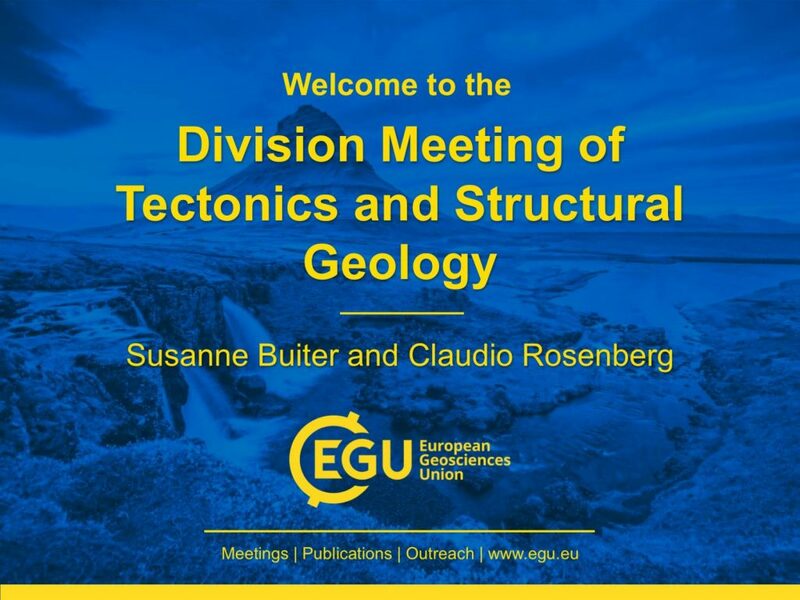 It is with great pleasure that we write this blog welcoming everyone to EGU’s upcoming General Assembly in Vienna, and especially to the many events organised by our division for Tectonics and Structural Geology! We are highlighting some of the week’s many events below, though it is in fact really difficult to choose highlights as of course the contribution of every individual to the success of the meeting is a highlight! 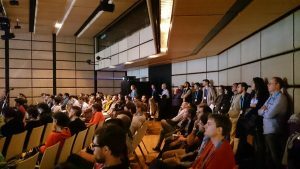 We would encourage you to download the meeting app (http://app.egu2017.eu) and/or make a personal programme (http://meetingorganizer.copernicus.org/egu2017/personal_programme) in addition to taking the above pdf schedule along to Vienna. 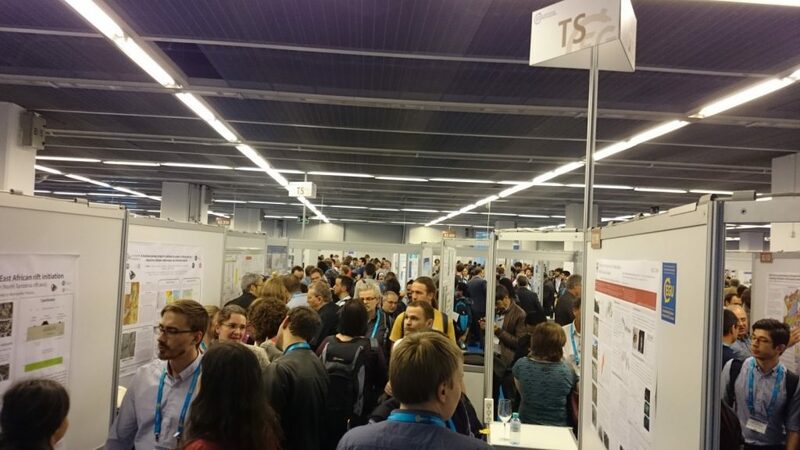 In the list below we emphasized award lectures, PICO sessions, poster-only sessions, short courses that TS co-organises, and of course the opportunities where you can give us feedback, such as the division meeting and Meet EGU. 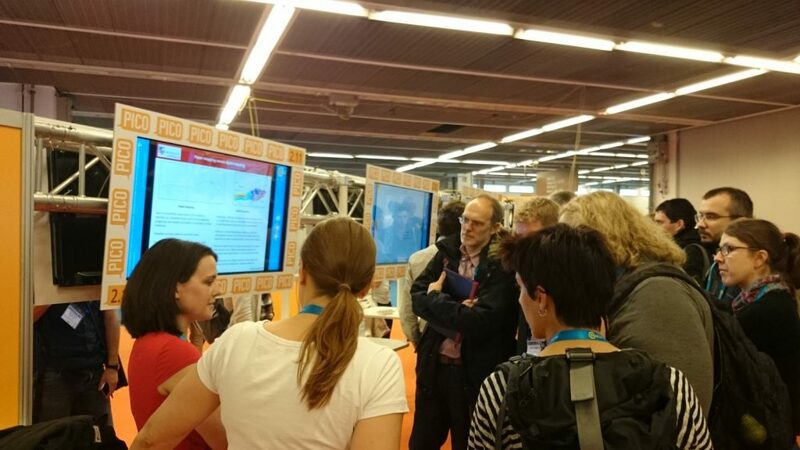 But please don’t forget that we are running several scientific sessions in parallel throughout the day! 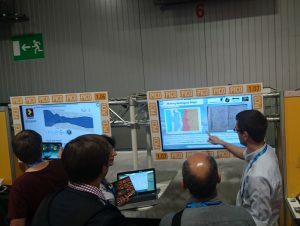 At the General Assembly and throughout the year, you can follow the division via our webpage (http://www.egu.eu/ts/home/), Facebook (http://www.facebook.com/TSdivision), twitter (https://twitter.com/EGU_TS) and the division mailing list (http://lists.egu.eu/cgi-bin/mailman/listinfo/ts). 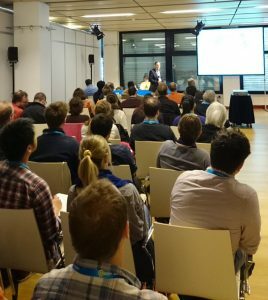 Don’t forget to tweet about the General Assembly using #EGU17TS and #EGU17!